Emma and Lumi, my inspirations and models! Whew! I did it! There were times that I wasn't sure that I could come up with a new post and a new rug every day. I must admit that I will feel a little lost now-perhaps I will take on this challenge again another time when I have collected a new batch of rug samples to show you! I do appreciate your visits and your comments and thank you for making my posts part of your day. I am grateful for your company and companionship! Please continue to stop by and visit...and I will continue to write about my fiber adventures. My dad said to me once "Kris, you always have a story", and I believe that I do! And I'd love to share them with you. This little fraidy cat hiding in a pumpkin is a pattern adapted from a Notforgotten Farm design. The rug above was hooked by Rebecca Erb. And this version was hooked by Wendy Miller. I love the scared little face on the cat! Again, I think it's interesting how a pattern can be hooked by two different people and each will have its own wonderful interpretation. I finally finished my sweet little bunny girl! Here is Ah Tis Spring, a Notforgotten Farm adaptation and hooked by me on linen with mostly #8 cuts, the lettering was hooked in a #6 cut. If you remember from a previous blog post last month, I was going to change the purple pantaloons. However, instead of immediately ripping them out, I decided to live with them for a while. When I got more color hooked into the design, I decided that I really did like the purple pantaloons after all. This is why I tell my students not to be so hasty about pulling things out and changing them...sometimes things just work out for the best! And some elements that initially bother you may look entirely different once more colors are hooked around it and the rug progresses. Give it some time, and it may save you some time. 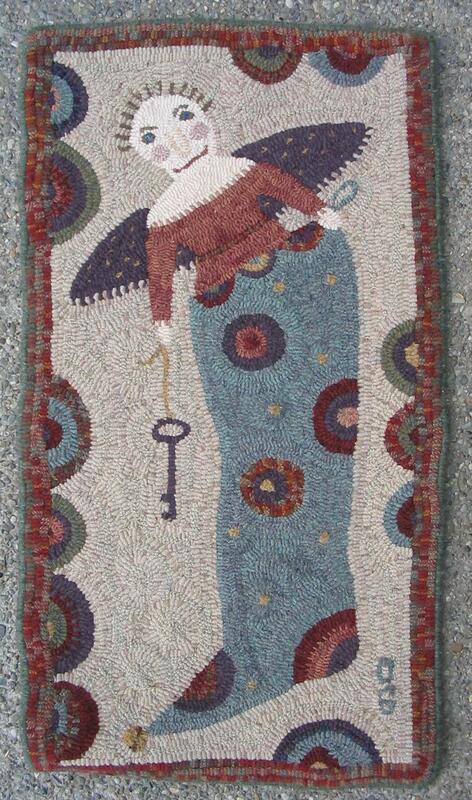 Herb Angel is the rug for today, hooked by me in #6 (for outlining) and #8 cuts. She is a favorite of mine and many of you feel the same way. Maybe it's her Mona Lisa smile that charms us. Again, I used some of my favorite turquoise blue, this time for her wings, and I really love the way it adds a nice spark to an otherwise fairly neutral color plan. This is a very tranquil rug. Here's to all of you who came out to the Black Swamp Spinners Guild Market Day on Saturday! It was a wonderful sun-shiny day, wasn't it? There were lots of shoppers and happy vendors. I appreciate everyone who stopped by my booth to say hello. I am also very grateful for your comments about following my blog and reading my Rug Of The Day posts! Thank you so much!!! 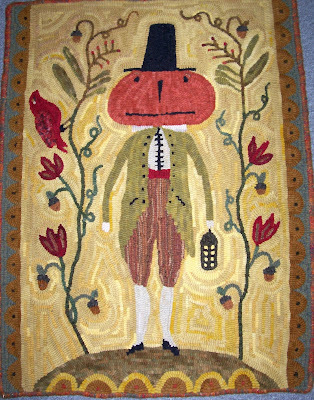 The rug for today is named The Forest Journey and it is an adaptation from PJ Rankin-Hults folk art. I hooked this several years ago and this is another rug that practically hooked itself. I had so much fun with color planning the animals...I definitely wanted the goat to be white (just like some of my goat-guys) and I wanted a purple bunny! This rug also brings back memories of ... my small close-call with fame! It's another really chilly day here in Michigan...so I don't feel out of place showing you a Santa rug! This is St. Nick, a Notforgotten Farm adaptation. 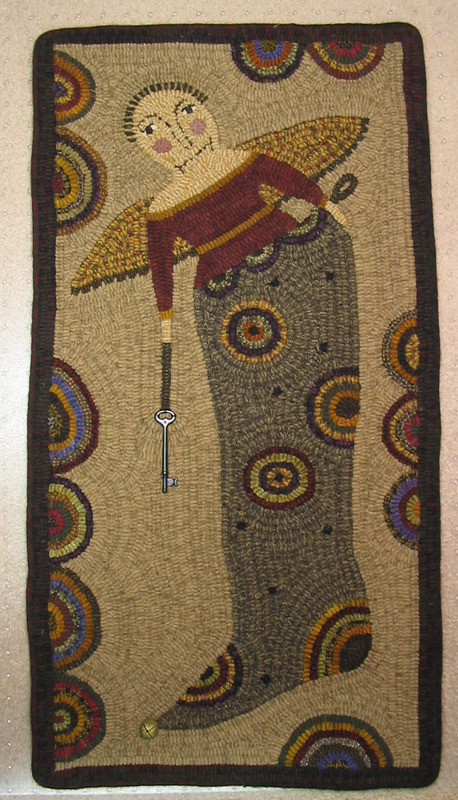 Sue Clark from Missouri hooked this wonderful rug during a workshop I taught at Wooly Woolens in Independence Missouri. I am as proud as a peacock over the way this rug turned out! I absolutely love everything about it and Sue's hooking is terrific! If you are in the Bowling Green Ohio area, please come over to the Black Swamp Market Day and Fiber Fair at the Wood County Fairgrounds. I'll be vending there and I've packed up lots and lots of REALLY good stuff! You won't be sorry you came...admission is free! All the info is listed in the upper right hand corner of my blog. Today's sweet little rug is The Stocking Was Hung, a Notforgotten Farm adaptation. This pattern has always been one of my favorites because I love the darling little angel-doll! There's just 9 months until Christmas (LOL!) so get your stocking prepared and in good order for the big night! The first rug is hooked by Wendy Miller. I call her "the queen of medium backgrounds" because she most often uses medium values in her background - not always easy to do since other similar color values will tend to "sink" or "fade" into them - and her rugs are always gorgeous. 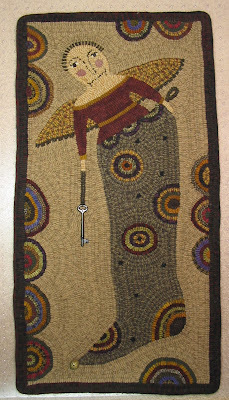 She sewed a real skeleton key and jingle bell on her rug...nice touch! Rebecca Erb hooked this version. I love the turquoise stocking! (Yes, it is her own Painted Cupboard Blue wool.) I love using old faded turqouise hues in my rugs and try to add it whenever I can. Turquoise is "friends" with so many other colors and shades, an all-around great addition to just about any color plan! Today's rug is a beautiful geometric hooked by Ginny Briner Crabtree. Ginny took my class at the Ohio Rug Camp several years ago. We added a bigger border around the game board so that it would fit on a table in her living room. By studying old Chinese Checker boards, I realized that the scheme of the board is much like a color wheel, and Ginny hooked hers with the color wheel in mind. I love how the the turquoise and beige/taupe textures work together with everything else. 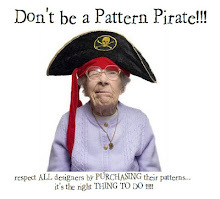 Ginny gets a special pat on the back because there are about a ba-jillion circles in this pattern! I think I would have lost my enthusiasm after hooking the first set of ten circles! Easter is just around the corner, so keep your eyes open for this little character...his name is Busy Bunny . He may leave a few eggs in hidden places. Or you may find some marshmallow peeps...does anybody really EAT those things??? This guy is a serious worker...you can tell by the fact that he wears overalls! Today's rug is hooked by Rebecca Erb. 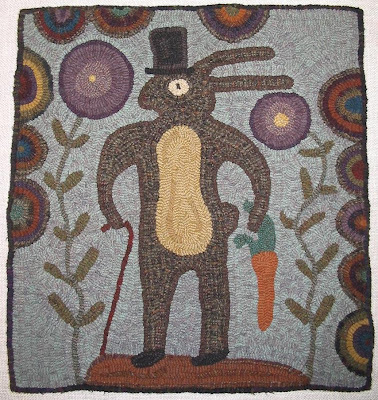 The Busy Bunny design is adapted from PJ Rankin-Hults folk art. I was going to start out my post today by saying that there was something fishy going on here, but then I changed my mind. When I looked at the calendar, I realized that today is my dad's birthday...so I'm going to dedicate the rugs of the day to him! And I'll tell you why in a minute. 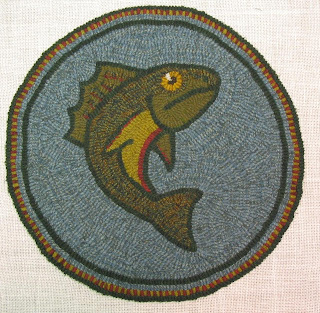 This is Trout, and I hooked this rug early in my rug hooking journey many years ago. It was designed by my friend Keith Kemmer. I met him at a spring Hook-In and he was working on his own Trout rug. I knew right away that I had to make this rug too. I ended up winning an honorable mention spot in Celebrations XIII. I take this rug to a lot of my shows but when it retires from the show circuit, it will take its rightful place next to my husband's side of the bed. This little chairpad is one of my designs called Leaping Trout. This was my teaching project for the ATHA Biennial in New Orleans in 2007. We had a great class and many fond memories. It's more of a cartoon character compared to Keith's Trout design but it's charming all the same. Now the explanation for why I wanted to dedicate this "fishy" post to my dad for his birthday today. You see, when I was young, I was quite a tomboy. My dad taught me how to paddle a canoe and we went canoeing and fishing together every summer in Northern Michigan. I baited my own hook and I even cleaned and scaled some of my own fish. There was a time when I caught more perch than my dad and my grandpa put together! My dad had a home-made fish smoker in the woods and there was nothing better than to eat smoked fish at the end of a long day. Saturday was the first day of Spring, right? Maybe I missed something because it's been just about cold enough to snow here in Michigan....it feels more like the first day of November! Please pardon my sarcasm about our weather (we'll be back in the 50's in the next few days) but since I had to break out my winter coat again, I thought a November-themed rug would be a suitable sample for today! 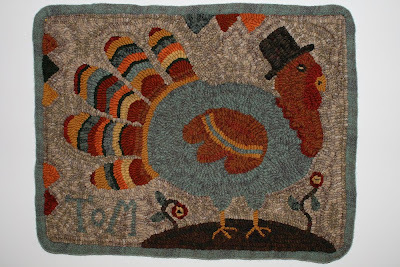 This is Tom, a Notforgotten Farm adaptation and it is hooked by Vicki Monroe from Zeeland, Michigan. Vicki's color choices are superb! I love the combinations of turquoise, rusty red and orange. Perfect! Often times, my rugs turn out to be a "fabric" diary. With each loop I pull, there is a multitude of memories being woven into the design. The memories might be happy or sad or they might recall certain events that were going on at the time. Memories of surgery and travel and friends. I can look at one of my rugs and reflect back about what was going on and how I felt while I was hooking it...a wondrous journey of my experiences that speak only to me. So this is the case with today's rug, Spring Messenger (another adaptation from Notforgotten Farms). This was the first rug that I hooked after my mom had passed away. I had not really felt like hooking much for a while afterward but somehow this little pattern was calling to me. There is a lot of healing that is hooked up in this rug. When I look at it, it is not sadness I see, it is the healing of an aching soul and the hope that life goes on. I think there is a little symbolism here with the momma bird watching over her precious eggs. Love and hope and new beginning. Just like the first day of Spring. The rug of the day today is an old friend to many of you. He is a very dapper fellow and quite a lady's man too! His name is Pumpkin Thyme. 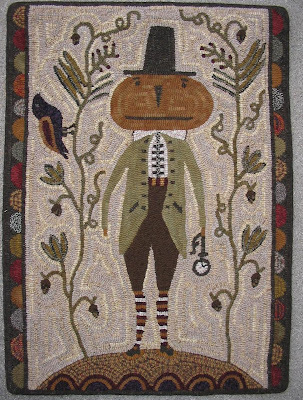 This charming character is an adaptation from Lori Brechlin's folk art. My good friend Wendy Miller hooked this version of Pumpkin Thyme. She dressed him up with striped socks! Mary Nyffeler hooked this Pumpkin man. She changed the watch to a lantern...a very cool idea. I like the little "glow" around the lantern. 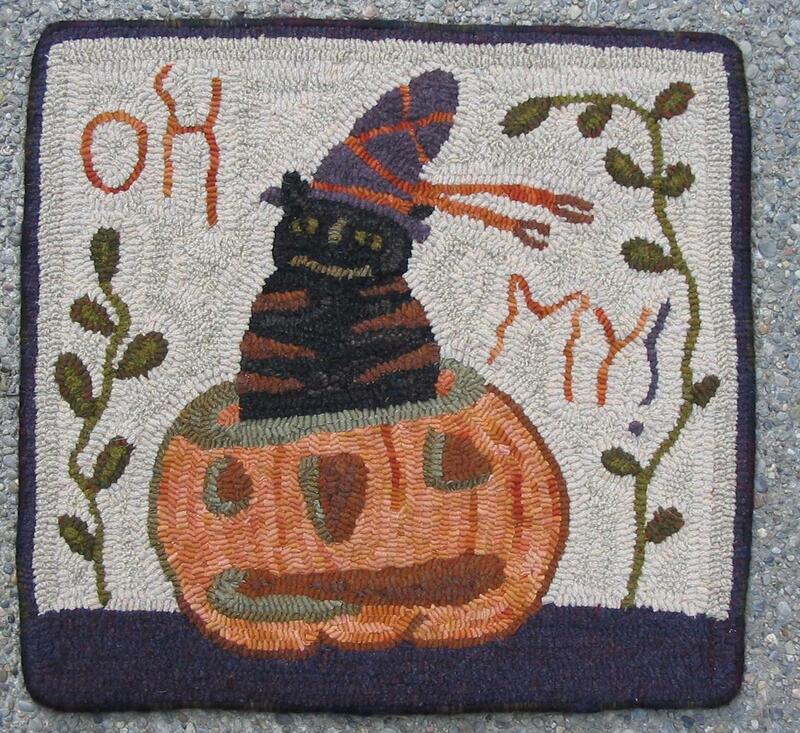 Debbe Myers hooked this rug. I like his red tweed trousers and matching hat band! Did I tell you that Mr. Pumpkin Thyme was very fashionable? This is Wendy Cockrell's rug. Another dandy Pumpkin man! 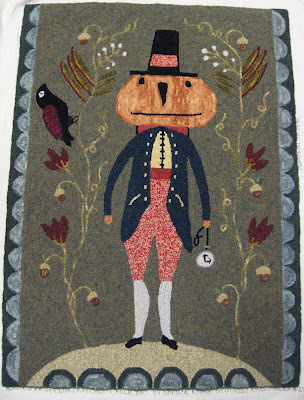 I think one of the most fun things about this rug is that you have the freedom to "dress" your pumpkin man in all sorts of splendid attire! and who should we meet along the way but Mr. MacGregor! 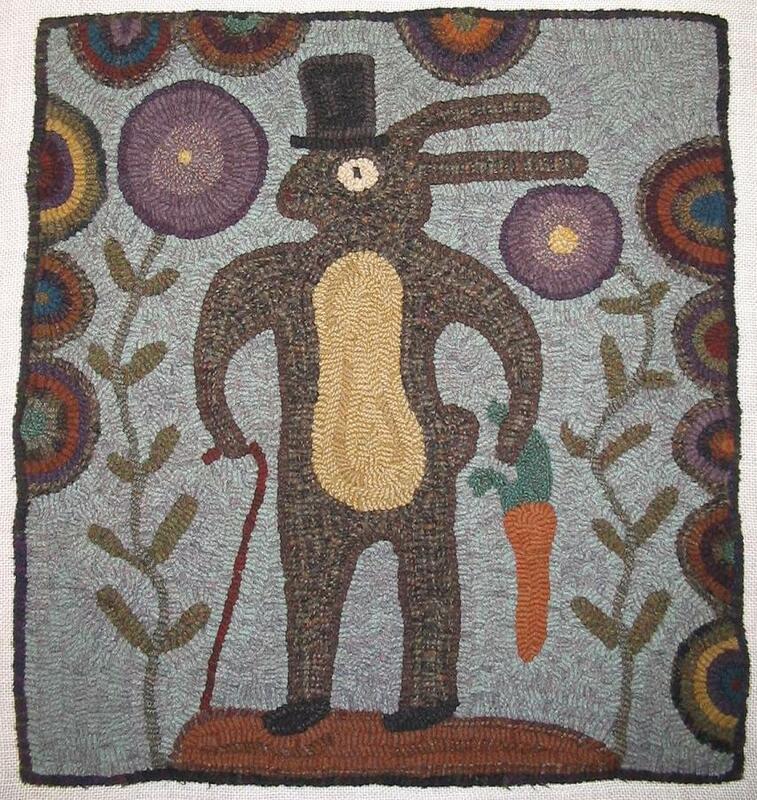 He's another wonderful adaptation from Lori Brechlin's folk art. I hooked this rug in #8.5 cuts. I love the "cupboard blue" background! I think the most difficult part of the rug for me was the hit-or-miss scallops along the sides....I called it "trial and error!" You will quickly learn how colors relate to one another when you start working with hit-or-miss. I know some folks find it easy to do but it was more thought-provoking for me. Still, it was a valuable learning experience and I love the way it turned out. We may get close to 70 degrees tomorrow! I wonder who will be out strolling in the sunshine tomorrow? Tropical Leopard is quite possibly my most favorite rug that I have ever hooked. I hooked this back in 2005 at a workshop I attended at the Woolley Fox. At the time, I had no idea what pattern I wanted to hook, but I had just designed this one. I brought the wool for the leopard and some paisley but really had nothing else in mind. Barb Carroll did the color plan and it all came together so wonderfully. The palm fronds are hooked from a beautiful piece of French paisley. I love the toothy little grin and the soulful eyes of the leopard. Someone once told me that this rug reminded them of an Edward Hicks painting (Peaceable Kingdom) and I thought that was quite a compliment. 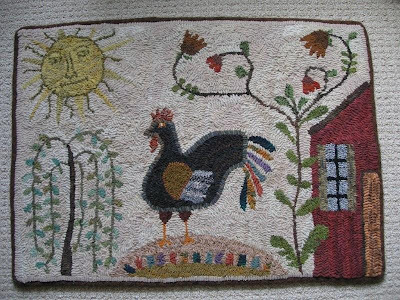 "I'd rather be on my farm than be emperor of the world"
I designed and hooked this rug which is an adaptation from an antique rug...a couple of years ago my friend found a picture of the original and thought of me instantly because it had a goat design. I call my version Homespun Goats. I hooked it on linen with #8 and #8.5 cuts. I used a variety of antique paisley pieces to hook the three little goats and the "bands" on the big goats. It was my first real experience with hooking paisley and I was nervous about it, especially cutting it! It ended up being really fun to do - the trick is to cut your paisley one size larger than the wool strips you are hooking. I got over my nervousness quickly and loved to see how each paisley piece hooked up differently. Even though this design is REALLY primitive, I think it is so charming. Yes, it has goats and you all know how I love goats! But I like to think about how the original maker felt when she designed this rug. She probably thought her goats were pretty special too. Maybe she was commemorating the fact that her billy goat and nanny goat had triplets...that doesn't happen very often and would certainly be a cause for celebration! And then, to dress up the border a little bit, she put her dinner plate on the edges and drew the curved lines. All very personal and home-spun. Did you guess who said the quote at the top of the page? March is the time of year for nimble Spring lambs so today we will visit the Wool Garden. 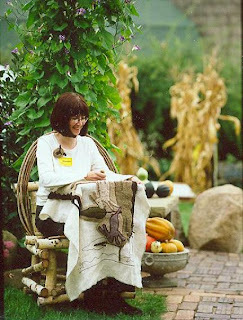 Wool Garden is another Notforgotten Farm adaptation and this rug was hooked by LaDonna from Missouri. This is such a lovely rug with its soft lavender and blue hues. I think it is absolutely wonderful! I especially love this design because of the sweet little lamb sleeping in the grass. I paid a visit to my friend Neil's farm on Sunday and got to see his newly born lambs! These are Scottish Blackface sheep that he has just recently added to his flock. The moms are lined up in the background and the babies are frolicking in front. These lambs are just one week old and look how big they are! Some of them already have little nubbins of their horns poking out. Daylight savings time! To honor all the bleary-eyed, sleep deprived folks out there who are missing their hour of sleep, here is something to wake you up... Oh Glorious Day, a Notforgotten Farm adaptation. 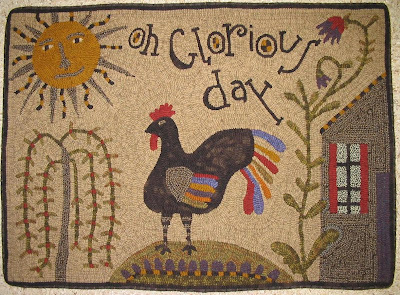 With a perky rooster and sly Mr. Sun, you can't help but smile today! This rug is hooked by my good friend, Wendy Miller from Indiana. I love Wendy's style and I love everything about her color plan. Cindi McCullough hooked this pattern. Her flower vine is wonderful and so is her house. This rug is hooked by Sandi Telzrow. I love her colorful lettering. Her yellow house is terrific too. Patty Hoffmeyer from Nebraska hooked this version. I love how she made all the "o's" blue and kept the rest of the lettering red. I am responsible for the bad photography here (I was standing on a chair when I took the picture!) but I wanted to show you this rug....look at the phenomenal face on the sun! Is that one JOYFUL face, or what? The purple house is pretty special too! I did not write down the name of the maker but I do know that it was someone in my Independence Missouri workshop from a couple of years ago. Enjoy your extra hour of daylight! I'm very partial to hooking animals...and I've hooked a lot of them! Today's rug is done by me on linen with a #8.5 cut and lots of yummy textured wool. This is Hex & Frex, a Notforgotten Farm adaptation and I hooked it in a workshop with Jayne Hester a few years ago. I love the old primitive feeling of this rug. Some of my favorite prim hues are in here...deep dark red/maroon and soft faded turquoise blue. I also love the directional hooking in each cat - the black cat's body is hooked vertically (straight up & down) and the red cat's spot is hooked horizontally (straight across). A lot of the old antique rugs were hooked directionally and I think the occassional straight-line hooking in this rug adds a clever touch to the design. Jane Austin said "There is nothing like staying at home for real comfort." 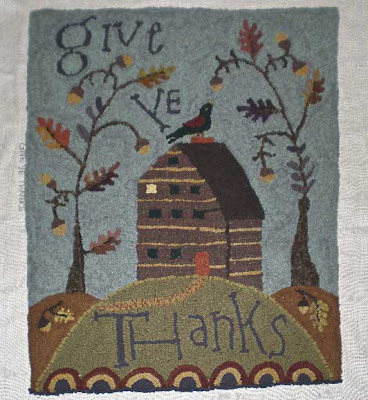 Today's post honors a very comfortable rustic home...Give Ye Thanks, another pattern adaptation of Lori Brechlin's folk art. 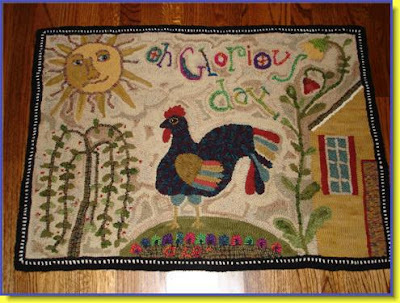 Lori Rippey from Michigan hooked this rug. Don't you love the toasty autumn colors? Yum! Here's Susan Pilotto's version where more lovely fall colors abound. I love the cabin...it looks like a fun place to live! I love how the blue sky plays with the brown colors in this version hooked by Debra Lloyd from Michigan. Sue Clark from Missouri hooked this rug and my favorite part of this rug is the red roof on the cabin. And that she hooked some "lights on" in her windows. (Look again at Debra's rug...she did the same thing...very cool, girls!). I love, love, love the background of this one!!! 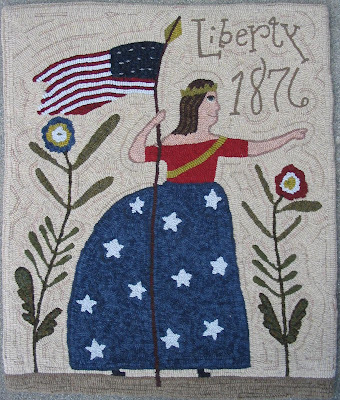 This rug was created by Kathy Simmons of Missouri. I love the dot in the letter A, as well! A nice quirky touch. I hope these cozy cabins have inspired you to snuggle up in your favorite place at home and get comfortable with your favorite project this week-end! This rug is hooked by Rebecca Erb from Pennsylvania. 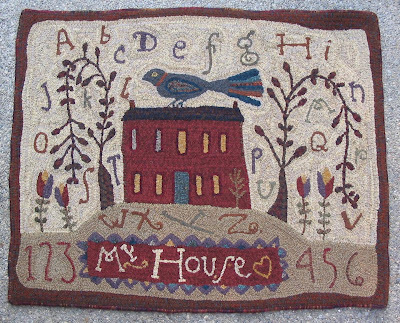 She worked a little heart next to the word "My House," a very sweet touch to this sampler. I had not put a name on this photograph but I'm pretty sure that Kathy Simmons from Missouri hooked this nice version (if I'm wrong, leave me a comment and I'll correct it). 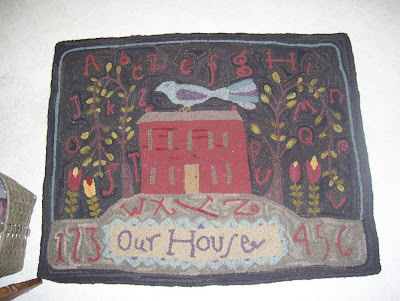 This beautiful sampler is hooked by Diane Eaton of Arizona. I love the way she personalized her rug by substituting her last name in the banner. The fourth rug is by Linda Thraen. She shook things up a bit by changing the sentiment to "Our House" and used a dark background. There will be more places to visit tomorrow on our "Home" tour! There's no place like home. So let's celebrate that sentiment with a couple of home-style rugs! Isn't this a beauty? This is Harvest Goode Things (a Notforgotten Farm adaptation) hooked by Loretta Bluher-Moore. I love the red plaid used on the house and I love the pumpkins too. Note the beauty line that wiggles around the rug between the border and the background - it's the same red plaid as the house. It makes a nice frame and unifies everything here in this rug. And this is my version, which you have probably recognized from last year's blog post, Diary of a Rug. I thought it would be interesting to compare the styles of these two rugs. Tomorrow we'll take another journey and see what other houses we can find in our hooked-rug neighborhood! 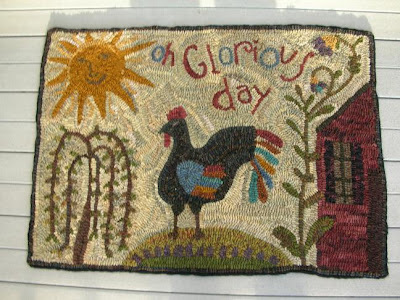 This little mat is another design adapted from the folk art of Notforgotten Farm. It's called Home Sweet Home, and it is really and truly a sweet treat to make! It was hooked by me in mostly #8.5 cuts. The special feature of this mat is that I finished the edge with a crochet stitch using my Hartman hook and #8 cut strips from the same wool as my background. I love the way it extends the background and makes the finished edge look nearly invisible. I am not a crocheter but found this to be fun and easy by following Karen Kahle's tutorial on her Flickr site. You might like to give it a try! I thought that a round mat was good to practice on, so I wouldn't have to deal with corners! The calendar on the wall in my office says that today is International Women's Day. To honor all the strong and determined women who have made our world a better place to live, I am presenting Lady Liberty, a Notforgotten Farm adaptation. I hooked this rug on linen with a mixture of #6, #8 and #8.5 cuts. This is another rug that I had fun hooking and was very pleased with the results, especially the faded blue color of Lady Lib's skirt. This is a two-toned wool from Rebecca Erb called Blueberry Plaid. I think any time you combine red, white, and blue in a rug, it is sure to be a winner! Happy Birthday to Lumi, my strong and gentle little Finn girl!